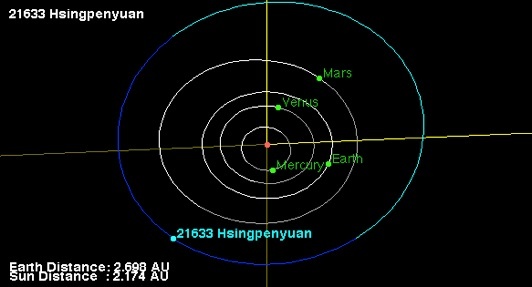 Orbital diagram of 21633 Hsingpenyuan (1999 NW11). This is a "main-belt" asteroid located between the orbits of Mars and Jupiter. I am extremely honored and grateful for having a celestial body named after me. Click here for a "live" view. With a passion in ecology, I participated in field research projects for many years. They have taken me from the peaks of mountains to the bottom of the ocean in a submarine. They have also led me across the world. Whether it is surmounting a cliff to reach an owl's nest in South Africa; running transects in the tropical rainforests of Costa Rica; directing the collection of specimen from deep-sea hydrothermal vents near Papua New Guinea; and measuring leatherback sea turtle nest temperatures in Trinidad, I am ultimately interested in doing ecological research that may inform conservation efforts. I also love to share my excitement about science with a general audience, having designed and presented interactive chemistry demonstrations to groups ranging from kids to adults. Originally from Taiwan, I received a Bachelor of Science (B.S.) degree in Environmental Sciences and Biology from Duke University in May, 2010. In August 2013 I completed my Master's degree (M.S.) regarding the impacts of the Deepwater Horizon oil spill to deep-sea coral ecosystems in the Gulf of Mexico. This was done under the direction of Dr. Charles Fisher at The Pennsylvania State University Department of Biology. This website is hosted on 100% solar powered, carbon free (no need for carbon credits! ), and rainwater cooled web servers running Linux in an environmentally sensitive, LEED certified facility. Please consider doing the same for your website.